In this final installment of the “What is Bavli?” forum, Prof. Christine Hayes responds to the four panelists. See here for part 1, and here for part 2. As mentioned, we plan on releasing all three installments as an ebook in the coming weeks. As several of their authors have observed, the four books under discussion today adopt different emphases in their study of the Babylonian Talmud. Dolgopolski provides useful labels for these two emphases: “conceptualism” – which he describes as focusing on the intellectual quality of the Bavli – and “contextualism” – which he describes as focusing on the genesis of the Talmud. He argues that the separation of these approaches is artificial and thus inauthentic. Classical Talmudic scholarship of the last 150 years, Dolgopolski tells us, has been contextualist, seeking to understand the genesis of the Talmud; only recently has the field witnessed a greater interest in conceptualism, which seeks to know what the Bavli is. Classical scholarship’s disinterest in conceptualism is myopic, Dolgopolski maintains, because contextualism cannot proceed without conceptions of what constitutes the Bavli’s proper context, and that in turn requires some prior concept of what the Bavli is. If I understand Dolgopolski correctly, since concepts precede contexts, since I must have some concept of a thing before I can locate it and appropriately analyze it, then there is first order conceptual work to be done before contextual analysis can proceed. For 150 years, then, scholars of Talmud have put the cart before the horse. There is some truth in what Dolgopolski says: it is true that in studying the context — the genesis and formation of the Bavli — we make conceptual assumptions about what the Bavli is. But this is an inevitable condition of the pursuit of knowledge. I cannot analyze or investigate anything without some prior concept of what it is I am investigating. Without a prior concept of the thing I wish to investigate, I cannot even select my analytical tools. What worries Dolgopolski, then, is not that critical scholarship has no conceptions about the Talmud (because he is right, the two cannot actually be separated) but that critical scholarship has not consciously crafted its conceptions of the Talmud and therefore its conceptions are generally wrong. But I confess that I am somewhat less worried than Dolgopolski about the state of critical scholarship. There is a great difference between a tacit – which is to say an unexamined, unconscious, and usually fixed and rigid – conception of the text on the one hand and, on the other, a working hypothesis, which is a conception of the text that is fluid and susceptible to modification and refinement as investigation proceeds. I think it is the first – the unexamined and rigid conception to which the text must yield – that worries Dolgopolski, and rightly so. It is the danger of the fixed and unconscious preconception that motivates his criticism of the classical contextual study of the Bavli’s genesis and formation, but the second – the fluid and continually adjusted working hypothesis that yields to and is reshaped by the text it theorizes – this is the very condition for the advancement of knowledge. And on the whole, classical critical scholarship has not been devoid of working hypotheses that have been revised as analysis proceeds. To speak in specific terms for a moment: very early critical scholars who broke with traditional ahistorical conceptions of the Bavli and conceived of it as a chronologically layered text preserving neat and distinct historical strata, developed analytical tools to expose those layers. But those tools uncovered contradictions and irregularities that raised questions about the historicity of attributions, and the role of rhetoric and ideology in the construction of these data which in turn challenged the very concepts that had led to their discovery, necessitating a more sophisticated account or concept of the relationship among the text’s component parts. David Halivni’s account of the relationship among the component parts was grounded explicitly in positivistic conceptions of the modus operandi of the historical persons who produced the text (the amoraim and stammaim), and corresponding conceptions of certain textual features as the result of error and aporia. His conception of the text suggested the adoption of particular analytical tools to understand its genesis and formation, but the data uncovered by these tools offered new challenges to Halivni’s underlying conceptions and Halivni himself has offered refinements of his working hypothesis. Shamma Friedman offered a concept of the Bavli that was less historical and more literary. His account of the relationship among the Bavli’s textual components mandated different, more literary methods of analysis. And in Friedman’s case, too, as analysis has uncovered irregularities and unexpected elements, there has been some refinement of the original working hypothesis or conception. If we look at the arc of critical scholarship over the past 60 years as a whole, we see that it has tacked back and forth between concept and context (to return to Dolgopolski’s terms), revising, correcting, reframing, and recalibrating each in light of the other. Viewed in this light, the more recent approaches of Vidas and Dolgopolski continue this pattern. Certainly, they push for a conceptual revision that is more radical than those we have seen in the past, but this is a difference in degree not in kind. As Shai Secunda has pointed out, Vidas adopts a critical stance towards scholarly conceptions of the contribution of the stam, focusing on the mechanisms by which the stam manufactures distance rather than harmony between itself and the earlier sources and invented traditions that it orchestrates. This leads Vidas to very different analyses of the Bavli’s component parts and very different understandings of how the Bavli came to be what it is. Even more radical, Dolgopolski considers any attempt at reading the Bavli for thinking historical subjects – whether named tradents (like individual amoraim) or unnamed discussants said to misunderstand or manipulate received traditions (like stammaim) – to be anachronistic and ill-fitting to the text. He conceives of the Bavli as a kind of collective memory, a thinking about thinking continually performed by a virtual identity. Warning: this book is not for the philosophically faint of heart and I confess that on more than one occasion lo yaradti lesof da’ato. My point is, however, that even radical reconceptualization represents not so much a break with the previous tradition of critical scholarship as a continuation of the process of tacking back and forth between concept and context, revised concept and revised context, and so on. Thus, armed with new and different concepts of the text, scholars like Vidas and Dolgopolski will identify anew the most appropriate and inappropriate contexts for its study, the most apt tools for its analysis and interrogation. And no doubt irregularities and inadequacies in their approaches, as in all prior approaches, will arise and lead to new conceptualizations and new contextualizations. The working hypothesis, then, is alive and well and it is the place where the conceptual and the contextual approaches not only find common ground and make common cause, but also recognize their deep and inevitable interdependence. The conceptual and the contextual are not best imagined then as first order and second order tasks. For just as our analyses of the text arise in some way from our concepts about it, surely our concepts about the text are not plucked from the air but arise in some way from our encounters with and analyses of the text or things like the text. The conceptual and the contextual evolve in tandem. Knowledge advances only when we are willing and able tirelessly to tack back and forth between concept and context, between hypothesis and data, between synthesis and analysis – in a continual feedback loop. I offer, therefore, a friendly amendment to Dolgopolski’s suggestion that it is the contextualist who seeks to understand the genesis of the Talmud but it is the conceptualist, and the conceptualist alone, who seeks to know what the Bavli is. I suggest that contextualism and conceptualism as practiced in the field of Talmudic studies are synchronous approaches both of which can be subsumed under and subtend the larger question: What is the Bavli? The contextualist, no less than the conceptualist, seeks to know what the Bavli is. The two simply approach the question from different angles of vision based on different intuitions about how the question is best answered. But the two are joined at the hip and are interdependent. It should be the aspiration and I hope the accomplishment of this generation of scholars to recognize this interdependence and to benefit from the synergy it creates. Let me make my meaning plainer. The question on the table is “What is the Bavli?” It seems to me that human beings in general have a tendency to approach the question “What is X?” in two different ways. For some, to ask “what is X?” is precisely to ask how X came to be, based on a strong intuition that the key to comprehending a thing’s character lies in understanding its origin, growth, evolution and formation. For some, to ask “what is X?” is precisely to ask what X does, based on an equally strong intuition that the key to comprehending a thing’s character lies in understanding its function measured in terms of how it is experienced by or affects those who interact with it. The four books under discussion today can be divided along this axis: Michal Bar-Asher Siegal and Secunda bring us closer to answering the question What is Bavli? by focusing on how the Bavli came to be while Vidas and Dolgopolski bring us closer to answering the question What is Bavli? by focusing on how the Bavli functions, how it is experienced by and affects its readers. Now this rough division, like all heuristic devices, is imperfect and at times each pair of scholars plays briefly in the sandbox of the others. As Bar-Asher Siegal has pointed out, to varying degrees and with varying emphases all four books use philological tools, lower critical and higher critical methodologies to understand how Talmudic texts came to be what they are. At the same time, all four books, again to varying degrees and with varying emphases, lift their gaze from the page of the Talmud in an attempt to answer bigger questions about the very nature and purpose of the text. I want to dwell for a moment on the “bigger question” these books all address in one way or another and that is the question of redaction, the Bavli’s final form. All four books assume intentional redaction and seek to expose the purpose or agenda behind that redaction, and yet despite this important similarity, the scale of their questions about redaction differs in an interesting way. And this might point to a conceptual difference that explains their methodological differences. Bar-Asher Siegal’s and Secunda’s questions about redactional purpose are local — what is the agenda of the redactor of this particular sugya or perhaps, set of related sugyot? Vidas’s and especially Dolgopolski’s questions about redactional purpose are global — what is the agenda of the redactor not just of this sugya but the Bavli as a whole, what is the voice of the Bavli? This would seem to be because Vidas and especially Dolgopolski have a stronger concept of the Bavli as an entity that can be grasped as a whole and if so, we may ask: is that view based on certain convictions about a sustained and global redaction of the Bavli? If so, what is the evidence for such a sustained and global redaction? Of course, it would be legitimate to respond that evidence for redaction (local or global) doesn’t matter — we choose to treat the Bavli as a single large entity simply because it functions as one for its readers, and function is pre-eminent in defining what the Bavli is and how it should be read. To turn the question around, do Bar-Asher Siegal and Secunda focus on local intentions and purposes because they have a weaker concept of the Bavli as an entity and view it as a thing that is best grasped in pieces? If so, is that view based on certain convictions about the incremental and local redaction of the Bavli, and if so what is the evidence for this kind of redaction? Does the choice to treat the Bavli as a congeries of local redactions arise from a conviction that rather than function, the process by which it has come to be as reflected in its redactional messiness is pre-eminent in defining what the Bavli is and how we ought to read it? It would be interesting to hear the authors of these four books address this methodological difference of local vs. more global claims and consider whether it stems from different basic conceptions of the work of the Bavli’s redactors. It is not only conceptualists and contextualists who must resist the temptation to see themselves as pitted against one another in a zero sum game. Different kinds of contextualists (those who seek to know what Bavli is by better understanding how it came to be) must resist a version of the same temptation. Vidas points this out in his discussion of Secunda’s contextualization of the Bavli with the Pahlavi sources on the one hand and Bar-Asher Siegal’s contextualization of the Bavli with monastic sources on the other. Vidas notes that the question should not be whether the Bavli is to be studied in relation to Christian OR Zoroastrian texts because communities are embedded, and indeed the Jews of Babylonia were embedded, in a multiple and complex set of contexts. This insight is gaining increasing currency among an even younger generation of scholars, many of whom seek to understand what the Bavli is by better understanding the rabbis’ simultaneous negotiation with overlapping social and cultural contexts. For Bar-Asher Siegal and Secunda this is no doubt a congenial idea since neither claims to have identified the sole context in which the Bavli must be read. Other recent and emerging scholarship, points to the multi-cultural diversity of the Sassanian empire. Yishai Kiel, for example, triangulates Talmudic, Zoroastrian and Eastern Christian sources to explore attitudes towards repentance; elsewhere he relies on Manichaean and Zoroastrian materials to explain the Bavli’s refashioning of older Enochic traditions. Dissertations currently underway at Yale explore the Bavli’s differential interactions with surrounding cultures (Zoroastrian, Manichaean, Christian and older Ancient Near Eastern materials) and heed Vidas’s call to revisit the question of the rabbis’ social location both within their own communities (casting doubt on the entire question of elite-mass relations) and within the larger Empire (where they might be better conceptualized as one minority group among others in a shared imperial setting). Pardon the Yale focus – these are simply the dissertations I know best. I have no doubt that equally exciting dissertation are being written elsewhere. This openness to diverse, complementary, not mutually exclusive comparative contexts as well as the recognition of the interdependence of conceptual and contextual approaches leads me to a final observation that will come as no surprise to those who have studied with me (and here I echo an observation made by Vidas but now applied more broadly). I offer this observation because the hope springs eternal in me that scholars of the generation represented by these books will avoid, or dare I hope cure our field of, what I consider to be an egregious, tiresome and very expensive (in terms of intellectual resources and time) affliction: the idea that someone has to be wrong in order for me to be right. I have been plying my trade for more than two decades, and I was rather quickly converted to the firm conviction that in the Humanities it is rarely the case that someone must be wrong in order for me to be right and that scholarship is best served when its practitioners do not understand themselves to be engaged in a zero-sum game. For the most part, I think that’s true of the books discussed today. Of course, there will be and there must be healthy disagreements among scholars. Of course there must be debate. Of course we have to employ the arts of persuasion and the canons of interpretation to present our conceptions of the data and bring others to see and understand what we see and understand. We are nothing if not explainers. That’s really all we do and of course, we will not convince everyone of our explanations and interpretations and we will not be convinced by everyone else’s. But when argument and persuasion turn into assertions not only that one is unequivocally right and that ipso facto almost everyone else must be wrong, scholarship does not advance. Rather it retreats, as scholars take up entrenched positions and devote enormous intellectual resources into defending these positions simply in order to be perceived as right, constructing impenetrable barricades that ensure they are talking only to themselves and their like-minded disciples. Scholarship advances and disciplines mature when scholars drop their pretty defenses, stop protecting their turf, and embrace the invitation to be engaged in something bigger and more enduring than their own careers – when they recognize that they are part of a multi-generational intellectual quest the demands of which exceed the abilities of any one of us but perhaps do not exceed the collective abilities of all of us. Such scholars seek out common ground that can become the basis for dynamic synergies and collaborations, instead of gleefully seizing upon minute differences that lead only to defensiveness and willful deafness. Such scholars applaud rather than fear and delegitimize those who pursue alternative avenues towards the common goal of knowledge – alternative avenues based on a different skill set or training or just a different intellectual temperament. To the extent that this spirit has prevailed among the four scholars featured on this panel, I applaud them. So What is Bavli? We haven’t arrived at an answer that can be tweeted in 148 characters or fewer, and I hope we never will because I need a reason to keep getting out of bed in the morning, but I do know that we have come some further distance toward appreciating the multiple possible answers prompted by the question, and I am confident that we will continue to do so as long as we encourage approaches to the question from different directions: because after all, it seems entirely intuitive and entirely plausible that in order to know what the Bavli is someone needs to explore how it came to be AND someone needs to explore what the Bavli does – they might be the same or they might be different “someones.” We need context and we need concepts, and we need them to function simultaneously and interdependently in a feedback loop. Scholarship, the pursuit of knowledge, is not and never should be perceived as an inherently zero-sum game. If we think we have to flatten and destroy before we can build, we’ll never get much higher than the ground floor. In this second part of our “What is Bavli” forum (begun here) Sergey Dolgopolski and Moulie Vidas take on Michal Bar-Asher Siegal and Shai Secunda’s monographs as they think about the Bavli and its contexts. Detail of a 19th century lithograph of the Vendidad. Image courtesy of Yuhan S-D Vevaina. Studies in philosophy and on the Talmud have been artificially – and thus not authentically – separated one from another. As the two books, Michal Bar-Asher Siegal’s Early Christian Monastic Literature and the Babylonian Talmud (Cambridge: Cambridge University Press, 2013) and Shai Secunda’s The Iranian Talmud: Reading the Bavli in its Sasanian Context (Philadelphia, University of Pennsylvania Press, 2014) collectively help us see, the current state of the field calls for undoing and/or renegotiating that artificial separation of the two fields. Instead of either conflation or mutual isolation of conceptual and contextual approaches to Bavli, there transpires a possibility and necessity of a well structured correlation between these two approaches. Complying with the structure of this forum, my guiding question will concern the relationship between “conceptualism” and “contextualism” (yes, the Oxford English Dictionary says this is a word). This is a separation that the structure of this forum explicitly introduces and, as I hear it, implicitly calls for undoing. The basic question of conceptualism is “What is Bavli?” The basic question of contextualism is “How did the Bavli come to being?” Which comes first? True to the history of the field, an answer for the first question had been taken for granted based on the conceptions shaped in the nineteenth-century yeshivot, where Talmud was studied and where its meaning had been produced and supplied to those who began asking the “critical” question, namely, the question of the historical genesis of the Talmud. The result was that critical Talmud scholars started by asking the second question, about historical genesis, based on uncritically assuming an answer to the first question, that of intellectual quality of the Bavli, as if the meaning-production in these institutions had no history of development of its own. However, the two questions are intrinsically complementary to each other. They therefore need to be separated more strictly to avoid an uncritical intermingling of one with another. By the same token, they need to be correlated more articulately than before. As I hope to show, a more careful separation between conceptualism and contextualsim leads to a reconnection between these two approaches to Bavli in a more productive way. I will make this argument by highlighting the already existing, indeed, crucial crosscurrents in developments in philosophy and literary theory on one hand and those in critical scholarship on the Talmud on the other. My aim is to show how these two fields of inquiry have always been effectively – but perhaps not articulately – connected one with another in terms of concepts they use and develop, despite all the artificially erected partitions between them. As part of this argument I will highlight where in the field of Talmud study crossing the boundaries between the partitions has been already happening more implicitly than explicitly; and how, with two new books on the table an explicit renegotiation of the relationship between the two fields, philosophy/literary theory and the study of the Talmud, becomes an increasingly pressing necessity. Answering to this necessity is also an opportunity. A renegotiation of relationships between Talmud and philosophy is also a heuristically rich opportunity to discern concepts that shape many competing answers on the question of what Bavli is, and thereby define competing approaches to Bavli’s contexts as well. In the past century, scholars of academic Talmud have focused on questions about the genesis of the Talmud without first working out the question of what the Bavli is. However, in choosing to ignore the more fundamental question they have already unwittingly committed to a certain answer. For how one answers the question of “what the Bavli is” affects how one approaches questions about the context and genesis of the Bavli. To make this argument, I will first map out the implicit answers of the question “what is Bavli” that various scholars de facto committed to when answering questions of context and genesis. I will then situate the new books by Secunda and Bar-Asher Siegal on the map. This map helps us navigate a variety of theoretical positions in, and orientations for, conceptualizing “what is Bavli.” Each locus on the map will be defined in terms of “person,” “meaning,” and “writing,” and their configurations. It will proceed from a simple linear model of “person” (author) as preexisting “writing,” and producing “meaning,” which leads to literary-historical contextualization of the Talmud. Then the map will move to models which grant the “rhetorical figures” of “writing” the power to produce “meaning” and to control the “person”; such models lead to literary-formal analysis of the Bavli’s genesis and transformations. The map will conclude with a model that denies the figures of “writing” that power to begin with, leading to a direct negotiation of the relationships between Talmud and philosophy as a way to conceptualize what Bavli is and thus to approach Bavli’s contexts. In the last century, competing configurations of the concepts of “person,” “writing,” and “meaning” dominated the discourse of critical theory. These debates, too, tacitly informed various scholars’ conceptualizations of “What is Bavli?” Thus, romantic literary criticism and its corollary representative in the field of Talmud study, David Weiss Halivni, combines “person” and “meaning” in the concept of a fourth element, intention. 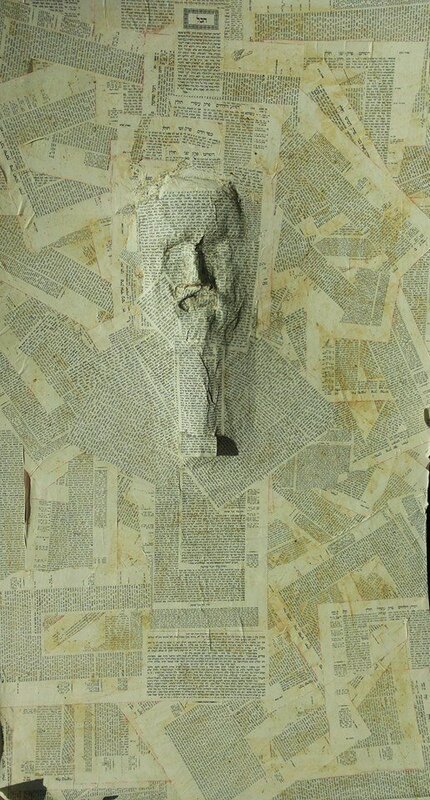 For Halivni, this manifested itself in his figure of the “stammaim,” who, as he sees it – whether as a “person” or a collective entity – historically precede “writing.” In contrast, New Criticism in general theory and its corollary representative in Talmudic studies, Shamma Friedman, locates intention directly in “writing” by making “person” and “meaning” the direct function of “writing.” In doing so, Freedman advances the method of close reading. That is, by avoiding the notion of “stammaim” (who precede “writing”) in favor of the ba’al ha-suya (who is both function and subject of the “writing”), he discerns the authorial intention in the “writing” but not in the preexisting “person” (of the author). In the next point on the map, “poststructuralist” thinkers, such as Roland Barthes – and for rabbinics Martin Jaffee – posit that the reader (or audience) is the author. Such an approach dismisses the notion of intention either in “writing” or in the “person” of the author altogether. These critics would consider “meaning” a part of “writing” that is revealed by the “person” of the reader. Zvi Septimus recent work on reading the Bavli takes up and promotes that line of development further by putting the function of the reader at the center of writing production, construction, and presentation to other readers and/or audiences. In light of a poststructuralist vantage point, Friedman’s position on the map can be further articulated as a new relationship between “writing,” “meaning” and “person.” For Friedman, “writing” controls the emergence of “meaning” in the “person” of the non-critical reader, who remains obedient to the rhetorical figures as they present themselves in the “writing”–even if such a reader is highly analytical. However, another “person,” that of the critical reader, traces the production (transformation) of the “writing” from an earlier stage to a later one. Thus, critical readers actively undermine the aspiration of the non-critical readership to absorb the “meaning” of the “writing.” Critical readers, on the other hand, by reading the “writing” as a record of transformations from earlier to later versions of the Talmud, provide what they assume to be the authentic “meaning” of the “writing.” For Friedman, therefore, rhetorical figures, such as shaqla ve-tarya or quotation, act on the “person” of the non-critical reader to seduce them into a false sense of the transparency between “meaning” and “writing,” one that is undone by the critical scholar. The work of Paul De Man on the epistemology of metaphor corresponds to this position of Friedman in the following way. For De Man, the critical reader sees metaphor at work where the non-critical reader (or thinker) does not. What’s crucial is that for De Man all “writing” is a metaphor, whether or not a reader or a “person” notices that. The non-critical reader merely views metaphor as an ornamental element; and the task of the critical reader is to reclaim the power of the metaphor (or other rhetorical figure) which is lost on the non-critical reader. By doing so, the “person” of the critical reader reveals true “meaning” of the “writing” as the work of the transformation. Daniel Boyarin’s early (Hebrew) work on Sefardi Speculation marks a similar position on the map, even though he works with other rhetorical figures (such as homonymy and invention [hiddush]) The “transformations” from the earlier to current versions of the Talmud in Friedman or the sorting out of false homonyms for Boyarin correlate to De Man’s epistemology of metaphor. At this point, the map of scholarly conceptualizations of “what is Bavli” in terms of “person,” “meaning,” and “writing” transitions to a radically different area. In this neighboring area of the map, “writing” – in the sense of rhetorical figures that produce meaning, such as metaphors – does not have enough power to control “meaning” or “person” because while metaphor seeks to explain something by comparison to another thing, it can only do its work by maintaining its utter distinctness from the thing it seeks to explain through comparison. That means the metaphor depends on, but does not control, the distinction on which it draws the comparison, and therefore the “meaning” conferred by that comparison. Derrida, and, in Talmud study, David Stern and the later [English] work of Daniel Boyarin on intertextuality, make this point. Once Derrida explained that metaphor insufficiently controls meaning, an engagement with explicitly philosophical and/or theoretical perspectives became necessary in order to understand how the Talmud produces meaning for its readers, whether critical or uncritical, for even De Man’s and Friedman’s critical reader is now also in a bind. To turn back to the coordinates of the map, if the rhetorical figures of the “writing” cannot fully control “person” and “meaning,” a direct engagement with the philosophical theory of signification becomes a necessity in thinking about what Bavli is. In a sense, the field of Bavli scholarship has already turned to directly thinking within the horizon of relationships between the Bavli and philosophy as traditions of thought. The recent work of Christine Hayes, Richard Hidary, and Jenny Labenz, among others, explicitly engages Greek philosophy as a necessary framework to be used for the historical study of the Talmud. Along slightly different lines, Barry Wimpfheimer’s recent renegotiation of the relationship between narrative and law (as well as of the constructed partition of the Talmud into Halakah and Aggadah) has also contributed to this process. Shai Secunda and Michal Bar-Asher Siegal two new books, too, contribute to that engagement, albeit, as I will explain, in an even more radical way. As stated at the outset, how one answers the question of “what the Bavli is” effects how one approaches questions about the context and genesis of the Bavli. The two new books by Bar-Asher Siegal and Shai Secunda expand the exploration of the genesis of the Bavli by including new contexts for comparative study – namely, Christian monastic and Iranian Zoroastrian contexts. For these scholars, conceptualizations of “what the Bavli is” informs their overall construction of context. That is, before these scholars begin to read the Christian monastic and Iranian Zoroastrian sources they have already (implicitly) answered the question of “what the Bavli is.” However, each of these scholars’ answer to the question of “what the Bavli is” belong to different areas on the map. They therefore approach contexts differently from each other. I will now plot their respective points on the map. I see Bar-Asher Siegal’s book as both occupying and further extending the space demarcated by Halivni and his notion of stammaim. This is the location on the map in which “person” combines with “meaning” to form intention that precedes “writing.” Jeffrey Rubenstein’s work on rabbinic culture also falls within this space on the map because for Rubenstein, too, the collective “person” (redactors) combines with “meaning” to form intention and precedes the “writing” (the Talmud). Based on this approach, he reconstructs the “culture” of the redactors. Similarly, while impressively extending this location on the map to embrace new cultural contexts, Bar-Asher Siegal, in her contextualization of the Bavli within a tradition of monastic literary culture, treats “meaning” as conflated with the “persons” of either the monks or rabbis, who in turn produce “writing.” It is due to her placement of “person” and “meaning” before “writing” that allows her to first see the Talmud as an “anthology” and therefore enables drawing comparisons between the Bavli and monastic anthologies. She thus goes at least two very important steps beyond Halivni and Rubenstein. First she expands the context of cultural comparative exploration to embrace parallels found in monastic literature, thus revealing a “culture” that the monks and the rabbis share. Second, she thereby creates a possibility to explore the reconstructed rabbinic culture in comparison with other cultures. The crucial point at which Bar-Asher Siegal’s and Secunda’s books differ has to do with their respective commitment, or lack thereof, to the notion of the stammaim. Like Halivni and Rubenstein, Bar-Asher Siegal commits to that notion. On the other hand, Secunda does not have to commit to the notion of stammaim in the first place because he follows Friedman’s conceptualization of the Bavli. I furthermore see Secunda’s work as occupying a different point, or rather drawing a different line, on the map, as compared to Bar-Asher Siegal. That line begins from and threatens to go beyond the territory marked by Shamma Friedman’s approach. Both Friedman and Secunda fundamentally approach the Bavli as “writing” in the sense of the record of its transformations. For Secunda, both the Bavli and the Iranian literatures are to be seen by the “person” of the critic as one general landscape – what he calls a “text-scape” – which can then be partitioned into segments or corpora, called Bavli, Zoroastrian texts, etc. In this approach, “writing” becomes the text-scape; “the person” is the critic looking at it from an elevated vista-point to discern the records of transformations; and the “meaning” is a record of the landscape, its segments (Rabbinic and Zoroastrian) and their parallel transformations that the critic discerns or discovers. What connects Secunda to Friedman is his focus on text-scape as a type of “writing” that is a record of its own transformation. Therefore, though Secunda mentions stammaim, he, just like Friedman, does not have to commit to the concept. What takes Secunda’s program beyond Friedman’s can be further defined as a synchronous diachrony of Iranian and Talmudic texts. That means Secunda expands Friedman’s model in the following manner: Friedman, whose method is to view the Talmud’s transformation diachronically, focuses exclusively on rabbinic corpora of writings. Secunda makes the next step. He introduces a parallel diachronic processes of transformation in Iranian Zoroastrian writings and compares two diachronic process, the Bavli, and the Iranian Zoroastrian writings, as synchronically developing next to, and in interchange with, one another. These parallel transformations belong to one and the same broader “text-scape,” which – and this is, I think, Secunda’s most important innovation – transcends any given partitions between the corpora, established in the version of Talmudic and Zoroastrian texts which are “le-faneinu,” to use Friedman’s term. Let me conclude mapping by situating these two books in regard to the last point on the map, the one marked by Boyarin and Derrida. At this point, “writing” as understood in either Halivni or Friedman cannot fully suffice to control “person” or “meaning.” Instead a direct negotiation of meaning-production becomes necessary. Because philosophy has so far been the only discipline to address meaning-production in the full scope of its complexity, in order to conduct such a renegotiation of the Talmud as a certain way of meaning-production scholars must take up the question of relationships between the Bavli and philosophy as modes of meaning-production, and thus as modes of thought. The connection of Secunda with this point on the map is as follows. Because in Secunda’s work synchronous diachrony of textual transformation becomes the guiding principle of contextualization, it brackets both culture and history, concentrating instead on text-scape as the original area of meaning-production, which is prior to either culture or history. Similarly, Bar-Asher Siegal’s work – even though it commits to culture and history to a much greater extent – no longer aims to learn about the culture of the Talmud based, predominantly, on reconstructing it from the Talmud, but rather compares it with the cultures reconstructed from, or implied by, other literary corpora of the “writing.” That leads to decentralization. Precisely because Bar-Asher Siegal finds no antagonism between monastic and Talmudic anthologies, her research opens up a possibility of departing from the notion of “context” which by definition implies a “surrounding” (culture) and a “center” (the Talmud). Instead, her book enables concentrating the research on an exploration of cultures without necessarily privileging any of them as the center. In that sense, Secunda’s “text-scape” and Bar-Asher Siegal’s “anthologies” perform such a decentralization – indeed nearly a cancellation – of the hitherto predominant notion of the “context.” Thus, “writing,” which these scholars address, extends beyond the traditional centralism of “context.” Needless to say, in light of this new, decentralized, understanding of “writing” the question of the genesis of the Bavli reemerges in new light and with a new power, as well, but that would be a topic of a different essay. Let me add that Bar-Asher Siegal’s and Secunda’s research opens up new questions about the “person” of a critical scholar and about the “meaning” that the “person” discovers in the “writing” as the record of genesis, thereby drawing new attention to the question of what Bavli is, now in the decentralized environment in which the notion of “context” comes into question anew. Let me postscript with a clarification inspired by the question-and-answer session at the AJS. One might ask, does not answering the question of “What is Bavli?” lead to essentialism? Therefore, is not the question to be dismissed on anti-essentialist grounds? My answer would be that the question of “What is Bavli?” is not the one I advocate for. My argument is only that this question has force. That means answering it — with either explicit or implicit answers — kept shaping thinking about the Talmud beginning from polemics with Karaites through Maimonides etc. My argument is that the question of “What Is Bavli?” continues to execute its force in modern academic Talmud scholarship too, and to that, and only to that extent, the question requires even more attention than it has received so far. The contextual study of the Bavli has seen its ups and downs, but the two works that serve as points of departure for this presentation constitute a particular moment in the study of the Bavli’s world. The books are very different: one cannot say that Secunda has done with Pahlavi sources what Bar-Asher Siegal has done with monastic sources. And still, both of them can be treated as securing these respective corpora as important comparanda to the Bavli, and they do so in works that present new methodological sophistication and more explicit attention to the significance of contextualization and the ways we may approach it. Since these two books and other recent works dedicate so much space to justifying and arguing for the very use of non-rabbinic or non-Jewish evidence in the study of the Talmud, at this point I’d already like to emphasize that the contextual study of rabbinic texts is now a fact; those who remain unconvinced by its necessity are probably not going to be convinced any more, and those who have been convinced are probably not going to benefit from further emphasis on this necessity. No longer is the question should the Bavli be studied “in context,” but rather: what are the contexts in which the Bavli should be studied; how should we study the Bavli in context; what does contextual or comparative study of the Bavli offer us in solving existing questions, and defining new questions, for our field. I am emphasizing this because, it seems to me, there is a danger for the lines of inquiry pursued by these books, and indeed by other works recently published on these subjects, that they will contend themselves merely with demonstrating the existence of parallel texts, of this or that shared motif, of this or that shared legal concept. Calling this a “danger” is controversial, I realize; many people present here might find such projects to be important, and even necessary. To me, it seems that the purpose of such projects, if they limit themselves to the mere demonstration of connection between Jewish and non-Jewish sources, has been well served in the past few decades of scholarship on rabbinic literature. At this point, especially with the publication of books that have given the comparative project such eloquent and sophisticated expression, the purpose of contextual study should be to serve broader questions. Both Secunda’s and Bar-Asher Siegal’s book already go beyond merely demonstrating the context. They probe broader historical, literary, and methodological questions, and the following observations are dedicated to these broader contributions and to where they can lead us in the future. One of the most interesting questions that comes out of the publication of these two books in chronological proximity is what the two projects – contextualizing the Bavli with Syriac Christianity and contextualizing the Bavli with Iranian and particularly Zoroastrian culture – mean to one another. Now of course, this should never be seen as a zero-sum game. The question is not “should we study the Bavli with Christian or Zoroastrian texts in mind?” That is because communities can be embedded in multiple and complex sets of contexts, and, perhaps even more importantly, because the Bavli does not reflect a homogeneous community – it includes sources from different locations and different times. Still, I think the presence of the Christian element, which scholars working on the Iranian/Zoroastrian side have not always taken seriously enough, should make us re-consider some of the assumptions we make when we study that Zoroastrian or Iranian element. Let me give for example an analytical perspective that is used and developed by Secunda but which was first applied to Irano-Judaica by Yaakov Elman in The Cambridge Companion to the Talmud. Elman suggested that we can place Babylonian rabbis on a spectrum: on the one end are the urban, upper-class cosmopolitan rabbis open to the “outside world,” who are willing to accommodate to Persian culture and were lenient on mingling with non-Jews; on the other end are traditional rabbis, far from the cultural centers of the empire, who resisted this accommodation to foreign culture and people (Elman 2007, 165-197; Secunda 2014, e.g. 3-5, 83). The consideration of the Christian element complicates this picture considerably. First, we are looking at multiple spectra in which there are multiple cultural options which can be constructed as “upper class” or “outside world.” In other words, one does not need to be a Persianized Jew to be a cosmopolitan Jew in the Sasanian Empire. Second, the Christian element, especially the non-polemical “shared worlds” which stand at the center of Bar-Asher Siegal’s study, raises the possibility that when Jews spoke unfavorably of Zoroastrian practices they did so not as part of some objection to the outside world or mingling with non-Jews but as a performance of a difference between two culture each equally “foreign.” (To give one prominent example, take the mockery of Zoroastrian “murmuring,” common to both Christian and Jewish sources). This diversity should warn us against vocabulary employed by Elman, Secunda (and others), of “accommodation” or “acculturation” and “resistance” and mapping these positions into a social distinction between the cosmopolitan upper-class and the more provincial and less aristocratic. But in terms of language choice, this story represents the mirror image of another Talmudic text. A teaching attributed to Rav Yossef (b. Sot. 49b and par.) argues that one should use either Persian or Hebrew, but definitely not Aramaic; in Elman’s text, Rav Yehuda supports either Aramaic or Hebrew, but not Persian. Now, to be sure, a rabbinic passage prohibiting Aramaic is problematic given ubiquitous rabbinic use of the language. But, if we take for a moment at face value, and if we compare it to the story about Rav Yehuda which Elman uses, then both texts seek to limit the use of language shared by Jews and others while endorsing either Hebrew or another foreign language (In Rav Yehuda’s case, we limit Persian, shared by Jews and Persians, in favor of either Hebrew or Aramaic; in Rav Yossef’s case, we limit Aramaic, shared by Jews and Christians, in favor of either Hebrew or Persian). Is it possible then that just as the Qiddushin story sees as its main threat Persian culture, the teaching attributed to Rav Yossef saw Bar-Asher Siegal’s “shared world” as the main threat? This would shed light on another teaching attributed to Rav Yossef which Secunda employs in which the Persians are portrayed negatively (and let me here assume for the sake of the discussion, with Secunda, that the attributions are reliable). Secunda describes Rav Yossef as a “resister” to accommodation of Persian culture – but, again, given that some negative portrayals of Persians are actually shared by Jews and Christians, this would not necessarily be a comment by an inward-looking Jew resisting non-Jews, but rather by a Jew participating in a conversation about the Persians which was shared by a set of Sasanian elites – the Aramaic speaking set, which included non-Jews. Finally, we should acknowledge that “resistance” often, perhaps even more often than not, comes from those who are most intimately familiar with the culture that is the object of resistance. Elman portrays the author of the story on Rav Yehuda and Rav Nahman as a provincial who resisted the upper class – but in fact, this author knows not only to employ the dialect he resists, but also to paint a compelling picture, complete with fine details of hosting decorum, of the very lifestyle he criticizes. The familiarity and access this story implies problematizes reliance on class or location in our explanation of rejection. The same can apply to Christianity, using Bar-Asher Siegal’s terms: the polemic engagement we find with Christianity in the Bavli is premised on the great deal of non-polemic interaction that she worked to uncover. Now, for the Christian element in the Bavli itself. Bar-Asher Siegal’s book focuses on “early Monastic literature” as a whole rather than on early Monastic literature composed and preserved in Syriac in the Sasanian Empire. 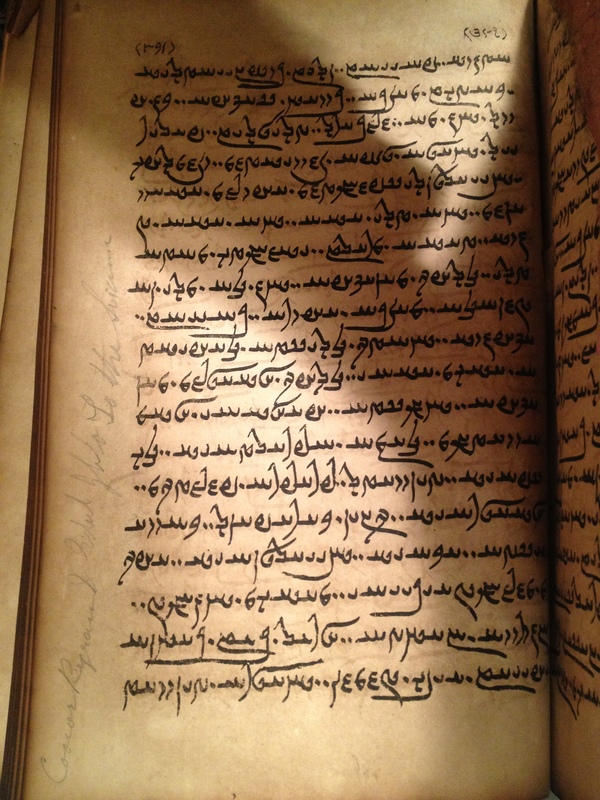 This in itself is the result of the varied and poorly documented nature of chains of transmission in antiquity – after all, even if a text is documented in Syriac, in Ctesiphon, we cannot know that a Jewish storyteller has encountered it. But the broad geographical scope of the book’s Christian sources raises the question of where the introduction of monastic elements took place. Bar-Asher Siegal is able to document definite “monasticizations” that are evident only in the Babylonian rather than in Palestinian versions of certain texts. But does that necessarily mean the modification happened in Babylonia? I’d like to offer an additional perspective here that focuses less on geographical difference and more on chronological difference. This should not be seen as a mutually exclusive alternative for the geographical considerations offered by Bar-Asher Siegal’s and other recent works – rather, it is complementary (indeed, Bar-Asher mentions this briefly, though it is not her main paradigm to understanding the connections she found). In this perspective, the Bavli represents more “Christianized” or “monasticized” versions of certain texts not just because it is Babylonian, but because it is late. Most of the Palestinian documents we compare with the Bavli are, after all, significantly earlier than it; and late Palestinian documents show much more engagement with Christianity than the early Amoraic documents (as far as the Tannaitic corpus is involved, I’m very skeptical of any claim to see a trace of Christianity). The “lateness” of the Bavli here is important in two respects. First, Christianity and monasticism have been established for much longer. The second, and I think more interesting consideration, is that particularly the editorial strata of the Bavli represent an era when the rabbis had much more popular influence and control than they had before. One possible consequence of this “rabbinization” of Jews might have been “rabbinization” of groups and traditions that were up until that period not part of the rabbinic project, and existed side-by-side the rabbis, but were now brought into rabbinic circles and rabbinic texts as Jewish culture became more and more centered around the rabbinic academy. Let me now move to contributions these books make that overlap with, but do not strictly belong to, the question of historical context. First, I’d like to draw out the implications of one of the most significant contributions of Bar-Asher Siegal’s study – the reconsideration not just of the textual affinity between monastic tradition and rabbinic (or “rabbinized” traditions) but also the relationship between the social and cultural phenomena that underlie them. I refer in particular to her study of ascetic behavior in Chapter 3 and more specifically the figure of the monk in Chapter 5. Now, we are far from the days in which Urbach and others, cited by Bar-Asher Siegal, happily distanced Judaism from asceticism. Work by Fraade, Diamond, Kalmin, Satlow, and Rosen-Zvi all showed that askesis, perhaps in a particular rabbinicized form, was important among the rabbis. But Bar-Asher Siegal’s study, because it is based on comparative textual analysis, does much to uncover the voices in rabbinic literature which think of askesis in Judaism and which construct the rabbi in terms closer to the way monastic literature portrays the monk. If Kalmin’s essay on rabbis and holy men centers on texts in which holy men are important, but in which they are portrayed as different from rabbis, Bar-Asher Siegal helps us see what Kalmin suspected, that is, that this is a response not to asceticism beyond or outside the rabbinic movement but rather from within. Also moving beyond strict contextual questions is Secunda’s final methodological chapter, which includes a wonderful account of rabbinic textuality in general and of the Bavli in particular. The chapter is admirable in its focus on reception rather than invention in tracking the Bavli’s context, looking at modifications of Palestinian traditions rather than texts which are Babylonian ab ovo. This is particularly useful because studying the Bavli in context is different from studying Palestinian rabbinic literature in context: the Bavli contains, and is structured around, Palestinian material; it expects its readers to be intimately familiar with Palestinian geography, with Roman institutions and deities, with some Greek words – and in many contexts it discusses those Palestinian elements more in detail than it does Persian institutions. Secunda’s point – that we must read these Palestinian materials too in a Persian context by looking at their particular Babylonian career – is convincing and important. The chapter’s most ambitious point is that this means that even when Palestinian traditions are not modified we should supply the Persian context ourselves. This seems to me methodologically problematic but descriptively very true. The reason we focus on modifications is that they are measurable. When we do not have textual variation, or when it is very uncertain where a textual variation was created or what it means, the reconstruction of the text’s context becomes very speculative. It calls for a lot of assumptions of what the author of the text must have known, assumptions that are very difficult to make in the state of our evidence (remember that some sugyot in the Bavli often do not know other sugyot in the Bavli – which makes it difficult to assume that just because certain Zoroastrian traditions can be documented in the Bavli’s time and place, it may be assumed to have been known by the author of a Bavli passage). But the fact that it is methodologically risky does not mean that the description on which this move is based is not true. In other words: Secunda’s description of how the Bavli worked as a text, his highlighting of the way the Bavli itself is always a reading of tradition that is almost predominantly located elsewhere than where it was reading it, is, it seems to me, a very powerful image of the Talmudic composition process. While it cannot serve as a good guide in reconstructing connections between the Bavli and Iranian texts, it opens new paths for understanding how rabbinic texts worked for their communities. In light of the recent publication of four books on the Bavli, a session (modeled after a predecessor on What is Mishnah) entitled “What is Bavli” was organized this past December at the annual Association of Jewish Studies conference. The panel considered recent developments in scholarship on the literary structure and cultural context of the Bavli, and discussed the possibilities opened by these developments; the broad historical, literary, methodological, and conceptual questions which they raise or imply; and the problems which the field currently confronts. The session was divided into two halves: “Approaching the Bavli’s Structure” and “Approaching the Bavli’s Contexts.” Continuing the round-robin tradition of the ‘What is Mishnah’ symposium, the authors of two new books on the Bavli’s context, Michal Bar-Asher Siegal and Shai Secunda, focused on books by Sergey Dolgopolski and Moulie Vidas which are animated by questions of form, while Dolgopolski and Vidas took on Bar-Asher Siegal’s and Secunda’s monographs, which are animated by questions of context. Then, Christine Hayes responded to all four papers. The result was a robust conversation about current scholarly interests and new scholarly horizons; in a way, a meditation on what we talk about when we talk about the Bavli. The Talmud Blog will be publishing the papers of this session over the next two weeks, and a PDF of the entire forum will be available for download when the forum is completed. We invite our readers to use the comments section to continue the conversation that was begun in Baltimore, and which will surely take us into the years ahead. The two books I was asked to address for today’s session are Sergey Dolgopolski’s Open Past: Subjectivity and Remembering in the Talmud (2012) and Moulie Vidas’ Tradition and the Formation of the Talmud (2014). These two exciting projects are a continuation, and in a sense a culmination, of recent academic trends in which the final product of the Talmud and the work of its editors are given full attention. In my overview I want to talk about these two books, but in relation to the other two books that stand in the focus of this panel, namely, Shai Secunda’s The Iranian Talmud: Reading the Bavli in its Sasanian Context and my own Early Christian Monastic Literature and the Babylonian Talmud. I see these four books not as two vs. two, as the structure of this panel seems to suggest, but rather as four books in a continuum with differences in focus. All four books try to juggle two different goals: The first is the careful use of methodological and philological tools in the study of rabbinic texts in general and the Babylonian Talmud specifically: From lower philological critical approaches and the use of manuscripts; critical editions of texts and linguistic examinations; to the higher criticism of texts including a strong emphasis on the layering of Talmudic texts. On the other hand, all four books, and maybe even more so Vidas’ and Dolgopolski’s, attempt to address “the bigger questions”: How was the Talmud written and why? All four books use textual examples to prove their claims. They offer careful and close readings of Talmudic passages but at the same time remember to lift their gaze above the page of the Talmud and look at the world in which these texts were produced, and at their authors who lived in these times. The topics these books engage can be outlined as (a) the historical question, (b) the literary question and (c) the ideological question. The historical perspective outlines the way in which the Bavli is a product of its time. The literary one tries to describe how the Bavli was written and in what way was it redacted. And the ideological inquiry deals with the authors or redactors’ agendas. In the different books the ratio between these questions change: Secunda’s and my own book put the historical question at the center: How is the Bavli part of its time and general culture, whether Christian or Persian. On the other hand, Vidas and Dogopolski focus extensively on the ideological aspect: What can we learn about the purpose of this corpus from its current form? As a matter of fact, Secunda’s and my own book deal with the other two questions as well. For example, the editorial perspective is naturally present when an external parallel to a talmudic sugya sheds new and surprising light on the literary editing of the Bavli passages. And the ideological issue is very much present in these discussions when the “melting pot” nature of the Bavli is revealed by these examinations: The amount and variety of the sources used in the Talmud is found to be much larger than previously thought, thereby strongly illuminating the agenda of redactors using these materials, their interactions with the world around them, and their choices when shaping this magnificent creation they were preserving for generations to come. Vidas and Dolgopolski center their arguments on the ideological question and offer two new perspectives on it: Dolgopolski uses (at times very technical) philosophical terms and theories to treat the final literary structure as means for discussing remembering and thinking. The rhetoric and dialectics of the Talmud should be viewed as collective thinking about the Mishnah. Vidas views this very structure as an attempt to construct a Talmudic figure invested in the project of innovation instead of simply recitation; עוקר הרים rather than סיני. But both books reflect on the other questions as well. The historical question is very much present in Vidas’s book in his chapters on Persian parallels and even in his consideration of the Hekhalot literature. Vidas, at the same time, pushes the historical reading aside when he claims that the layers of the Talmud are NOT a product of historical transmission of texts through the ages, but rather a product of a sophisticated rhetorical editing. But as he clearly shows, the mere attempt to use these rhetorical tools is in fact a historical product of the redactors’ times. Dolgopolski, on the other hand, criticizes Halivni and Friedman for the historical descriptions their research produces. He comes out against their work by undermining their philosophical assumptions. Dolgopolski contends that by viewing the Talmud’s sages and its various editors and “montagists” as historical subjects they were looking at textual phenomena and offered a historical scenario for their creation. The options are not, and should not be, limited to identifying their misrepresenting ancient traditions due to either intentional manipulation or mere mistakes. Dolgopolski deals in fact with the historical question by suggesting that a different philosophical understanding of these Talmudic entities will lead to a more accurate historical description, by which they should be treated as non-thinkers rather than thinkers; a collective thinking by remembering. We got the history wrong because we failed to understand how modern thinking and remembering is so much different than ancient ways of thinking and remembering. Notice, however, that I just assumed a very wide definition of the historical question. In fact, a comparison between the four books reveal that they address a slightly different historical question: Secunda’s and my own book assume historical factors that left their marks on the texts – marks that we can recognize by using textual, literary and philological tools. But Vidas and Dolgopolski look to the final and complete form of the texts in order to offer a historical description of its creation. In other words, Secunda’s book and my own look for the cracks, the discordances, and the inconsistencies to reveal the complex creation of the text. Vidas and Dolgopolski, on the other hand, seek to turn their gaze to the final form: What it tried to achieve and what it does to the traditions it is clearly trying to preserve for both the people who preserved them and to those who read them to this day. Using a different analogy from Dolgopolski’s discussion of film theory: While the former try to dismantle the theatre scenery to reveal what’s behind the curtains (מאחרי הפרגוד), the latter try to enjoy the façade of the theatre in all its glory. As for the literary question: How was the Bavli redacted and in what way? Vidas and Dolgopolski obviously deal with that as well. As I mentioned earlier and as is evident in both their books, both Vidas and Dolgopolski look at the final product of the Talmud as a complete literary creation. They assign great importance to the final product and the intention behind its creation, and in a sense come out against the local inquiries of Talmudic sugyot without the ramification for the larger question of the corpus’ redaction. Vidas, more so than Dolgopolski, handles the details of the redaction and, for example, brilliantly show that not only does the Bavli not offer a literary structure ex nihilo for the existing traditions, but it actually replaces one structure for another. Vidas suggests that this is done for the purpose of giving itself the critical distance from the texts they are transmitting and allowing for innovation. Obviously, the ideological question stands at the center of both Vidas’ and Dolgopolski’s books. The ideology they assign to the redactors of the Bavli shares the same starting point, though it ends up in very different places. Both put at the center of their focus the Bavli’s goal of preserving earlier traditions. They both acknowledge the centrality of this concept and the self-evident importance of this goal in the creation of the talmudic corpus. However, Dolgopolski articulates a position that wishes to limit our understanding of these actual talmudic figures to simply transmitters of the traditions – “Placeholders for textual traditions,” as he calls them. They should not be evaluated as “actual persons” in the sense that they should be understood as thinkers and there is no significance to the structure or content of their own actual arguments. There is, in fact, no real dialogue in the Talmud and the “author” is fictional. We must evaluate what we read as “choreographed roles” in a larger collective thinking project. Vidas on the other hand, starts with this same point of departure – namely, the preservation of past traditions – but pushes us to see the Talmud’s redactors as transmitters of tradition as well as taking an ideological stand towards these traditions that they are transmitting. They purposely differentiate themselves from what they are transmitting. The comparison to the Palestinian Talmud shows a deliberate creation of layers, a creation of an intentional literary gap between the past and their own present. In other words: if Dolgopolski wishes to stress the non-thinkers, Vidas wants us to look for the thinkers. The shared sense of intentionality in the literary creation of the Talmud’s final form, as well as some kind of unified purpose to the whole corpus, stand at the core of both books. This stance, rather than allowing explanations based on elements of random historical accumulation or even the possibility of multiple descriptions of text creation, will undoubtedly stand at the center of debate with other Talmudists dealing with these same questions. How much intentionality can we assume in the creation of a text? And how realistic is it to ask scholars to abandon the historical inquiry into an obviously layered text in favor of Dolgopolski’s movie-like montage? But for this Talmudic scholar, the experience of reading these two innovating and exciting research projects mostly signal a promise for much renewed interest in the big question that is: What is Bavli? In his review of Moulie Vidas’ Tradition and the Formation of the Talmud, Itai Marienberg-Milikowsky noted how a number of new works on the Bavli (including those considered in this session) attempt to look beyond their particular research project and gesture towards the greatest question of all, namely, “What is the Bavli?” This question is necessarily ponderous, as it concerns a nearly two-million word compilation which has itself spawned a labyrinthine commentarial tradition of near-impossible proportions. Yet in practice, the query may also be approached in the still, small voice of the individual sugya. On more than one occasion I have found myself in the classroom prodding philologically-minded students to take a step back and consider, for just a moment, what exactly the textual artifact before them is, how it presents itself, and how it relates to the times and settings from its protracted formation to the moment it rests on their desks. Even after retracing the steps from hasty pre-class photocopying to digital transcription; printed editions; manuscript codices; ancient scrolls; crystalized recitations; earlier, freer, oral “redaction,” all the way to some kind of talmudic “big bang,” I press them further: Still, apart from its historical development what is this thing? What does it reflect and how? Better, how does it present itself to the world? At this point the conversation becomes more abstract – as it surely must for physicists inquiring into the early moments of our universe’s existence – and the technical vocabulary that generally serves academic Talmudists so well begins to fail. Sergey Dolgopolski’s Open Past: Subjectivity and Remembering in the Talmud is an ambitious attempt to look at this unwieldy question. It is a necessarily difficult book for Talmudists, and not only because most Talmudists lack a solid background in Heidegger. The Open Past develops a critical approach to critical Talmud research and so must by definition stand outside the conventional discourse in order to re-consider what exactly the Talmud does in the sugya and how the Talmud’s various figures (from named authorities to unnamed discussants; and from editors who frame the material and those who manipulate the texts to “montagists” who juxtapose the Talmud’s larger sections) should be assessed. If this were a standard work of the field, one might have assumed that Dolgopolski’s interrogation of the common equation between the different talmudic voices with “real” autonomous thinking-subjects located in history was just another reassertion of Neusnerian skepticism about attributions and historical reliability. But it is surely not. Apart from challenging Western philosophy to reconsider notions of subjectivity, thinking, and remembering in light of Talmud, Dolgopolskiis asking us Talmudists to probe the basic axioms of our discipline and consider whether the constant attempt to read for historical subjects who either misunderstood or manipulated their received traditions is both anachronistic and ill-suited for appreciating what the Talmud actually is. The focus of The Open Past’s inquiry concerns authorship and its potential location(s) in the sugya. By now any contemporary Talmudist worth his salt could rattle off a basic bibliography on the inapplicability of modern notions of authorship to the Talmud, which would surely include Barthes, Foucault, and the likes of Martin Jaffee. Dolgopolski argues that it is still not enough to uncritically replace modern authorship with a final-stage anonymous stammaitic collective, since both cases presume an overarching thinker (or group of thinkers) who from within and without the text actively use the mind to orchestrate the sugya’s discussion – an anachronistic idea. Instead, he argues that the sugya presents itself as late antique intellectual specimen where thinking about the Mishnah does not occur within the individual minds of its historical editor/redactors, rather it collectively emerges among the text’s virtual figures who practice a largely non-mnemonic art of memory whereby the Mishnah, alongside parallels, is actualized (that is, “remembered”) by way of heavy-hitting dialectical discussions that ultimately support it. The poetics of the sugya are then fascinatingly compared to film, a cultural artifact similarly oriented towards an assumed audience whose gaze experiences the pairing of (film-)cuts from an assumed position in front of the screen. While it might be interesting to occasionally ponder the filmmaker and her external historical position in relation to the figures depicted within the film, this is surely a marginal pursuit. It is not for naught that that we expect film criticism of The Godfather to focus on its compelling cinematic artistry and not the historical manipulations of Francis Coppola as he tells the story of mid-century Mafiosos from the vantage point of 1970’s Hollywood. Why then do we Talmudists generally assume that our primary task is to trace a sugya from its early Palestinian kernel as it is manipulated by anonymous redactors who rework conversations of prior sages from the position of sixth century Babylonia? If my brief account seems opaque, it is not only because I cannot possibly, adequately, summarize the book’s highly complex and lengthy argument in the space allotted, but also since it again constitutes an attempt to step outside our dominant Cartesian paradigm wherein the main action worthy of interest in human affairs takes place in a succession of thinkers who collectively produced the Talmud “from the outside” over the course of an historically-defined time period. The result of The Open Past is fascinating and deeply thought-provoking, yet to my mind not enough to push Talmudists to suddenly abandon their preferred disciplinary focus. Yes, it is indeed a strange accident in the history of scholarship that what interests many of us is still the production of this incredible piece of literature in a specific time and place from within a specific culture. And yet we will continue to reach for that cultural moment(s) – if now with a more self-aware posture – at virtually any cost. What might “post-Open Past-critique” Talmud scholarship look like from within the discipline? I would like to think the answer can be found in Vidas’ Tradition and the Formation of the Talmud. Apparently, this book was not written with knowledge of The Open Past, yet it nevertheless develops a related, critical stance towards the assumptions modern Talmudists have made about the contribution of the Stam. Specifically, the Stam has been conceived of as a historical force that quite actively reframes earlier textual kernels in an attempt to continue a glorious rabbinic heritage in the contemporaneous moment. The main event is to be found in the Stam’s anonymous layer, which with its distinctive Aramaic idiom directs the action as a voice-over might narrate the events in a documentary film. Vidas challenges this view of the Talmud’s textual history by engaging in cultural archeology that demonstrates how the Talmud’s editors are actually quite opposed to a full-throated celebration of older tradition in the present. The strongest moments in the book are Vidas’ examples of sugyot that appear to contain late directorial voice-overs, yet which are shown in fact to be cinematographic tricks of the eye. The activities uncritically attributed by Talmudists to the Stam may in fact be a contrived poetic devise that deliberately manufactures distance between older sources and invented traditions. In the film, a former drone operator details the procedure of releasing a missile towards a human target while the movie follows a child riding a bicycle in an environment that is both manifestly different yet eerily equivalent to the one described by the operator (previous and subsequent cuts in this work contain similar, disturbing pairings). A worthwhile exercise would be to try, if you dare, to produce a diachronic analysis of the various elements in this film – something along the line of Shamma Friedman’s system for visually marking tannaitic sources, amoraic statements, anonymous material, etc. What would become clear, I believe, is that in both Fast’s work and the Talmudic sugya the achieved, sometimes vertiginous effect is intentional and should be read not as a straightforward historical-produced compound, but as a friction-producing poetic device. Put differently: The history of production is marginal. The real story is the art. Stay tuned for the next two installments, first from Moulie Vidas and Sergey Dolgopolski, and then Christine Hayes’ response. Three weeks ago, I set out for Antwerp, Belgium for the Jewish Law Association international conference. The Jewish Law Association brings together academics, lawyers, dayyanim and ethicists from Israel, Europe and North and South America to have conversations about Jewish law in a variety of historical time periods, locations, and contexts. Hosted by the University of Antwerp, the conference engaged explicitly with the local environment through a tour of Jewish Antwerp, and a visit to the Holocaust Museum in nearby Mechelen, Belgium, timed to coincide with the Fast of 17th of Tammuz. These tours created space for smaller-scale conversations and reflections over the course of the week. This year’s JLA was also a transitional year, bidding goodbye and saying thank you to the leadership of Prof. Bernard Jackson, past president and outgoing Chairman of the JLA, and welcoming a new board headed by Amos Israel-Vleeschhouwer and Phillip Ackerman-Lieberman. Their closing remarks focused on collaboration, cooperation, cross-disciplinary interaction, increasing the JLA’s online profile, and creating a space in which researchers at all stages of work can give and receive feedback on their work. I am sure all participants look forward to seeing their vision realized at the next international conference in 2016. RABBIS AND OTHER JEWS: Rabbinic Literature and Late Antique Judaism, Yale University, May 11 2014. 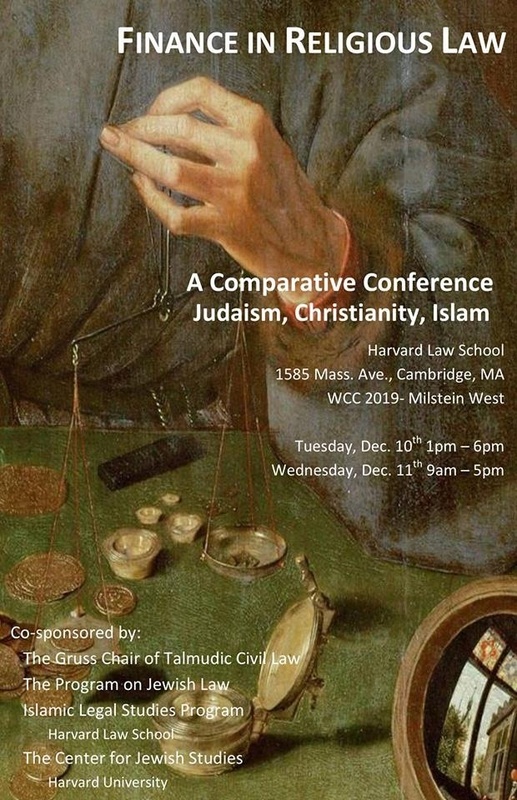 This conference brings together colleagues and former students of Professor Steven Fraade, the Mark Taper Professor of the History of Judaism at Yale University, to workshop papers in anticipation of a festschrift in his honor. Prof. Fraade has made important contributions to the study of, among other things, law and rhetoric in the Dead Sea Scrolls and in tannaitic literature (for which see most recently the collected articles in Legal Fictions: Studies of Law and Narrative in the Discursive Worlds of Ancient Jewish Sectarians and Sages), and the ways in which rabbinic literature can be situated within late antique Judaism more broadly (in such articles as “Rabbinic Views on the Practice of Targum, and Multilingualism in the Jewish Galilee of the Third-Sixth Centuries,” in The Galilee in Late Antiquity). The conference papers, taking their cue from these contributions, will focus on the relationship between rabbinic (chiefly tannaitic) literature and the rabbis’ contemporaries and Second Temple predecessors. With Shavuot behind us, no holidays on the horizon until September, and summer break in many other parts of the world, it’s high time for conference season here in the Holy Land. Here’s a list of what will be going over the next few weeks. The full program is available here. Those who won’t be able to make it can be comforted by the fact that Orion is usually pretty good about putting out conference volumes (see here for the most recent one). 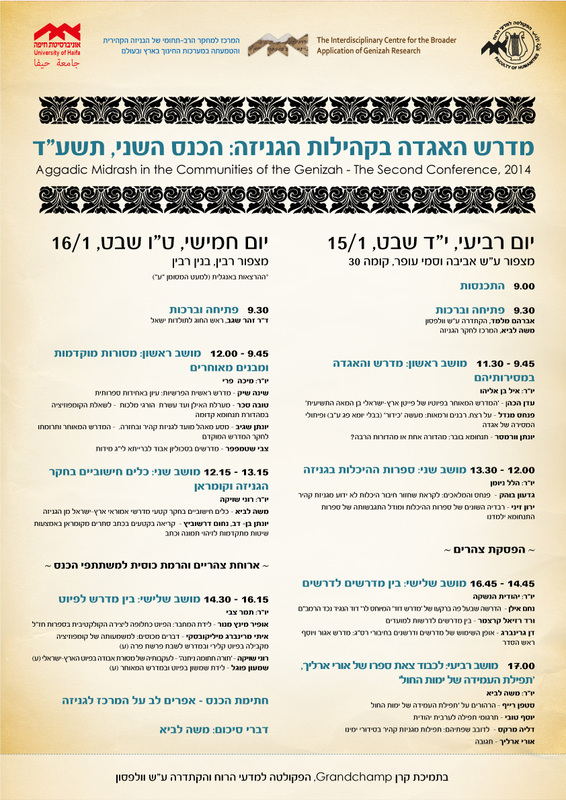 At the same time, there will be a conference in memory of the scholar of aggada, Yona Frankel. The conference starts the evening of May 28th at the Schechter Institute in Jerusalem, and continues the following day at Ben Gurion university in Beer Sheva. The following week, on June 2-4, Tel Aviv University’s Center for Religious and Interreligious Studies will be having a joint conference with The Cambridge University Project for Religion in the Humanities entitled “‘With God on Our Side’: Holy War and Sacred Struggle in Judaism, Christianity and Islam A Collaborative International Conference in Interreligious Studies” here’s the schedule. This is the first conference to come out of a new joint venture in interreligious studies of the two universities. And on that same week there will be a conference in honor of the folklore-rabbinicist, Galit Hasan-Rokem in Jerusalem (June 5-6). Later in June, on the 25-27, Hebrew University will be hosting a conference entitled “Patristic Studies in the Twenty-first Century: An International Conference to Mark the 50th Anniversary of AIEP/IAPS.” From the preliminary schedule, this looks like it will be kind of mega-conference with big international scholars participating and also a fascinating mix of typical academic research and also more reflective theology. 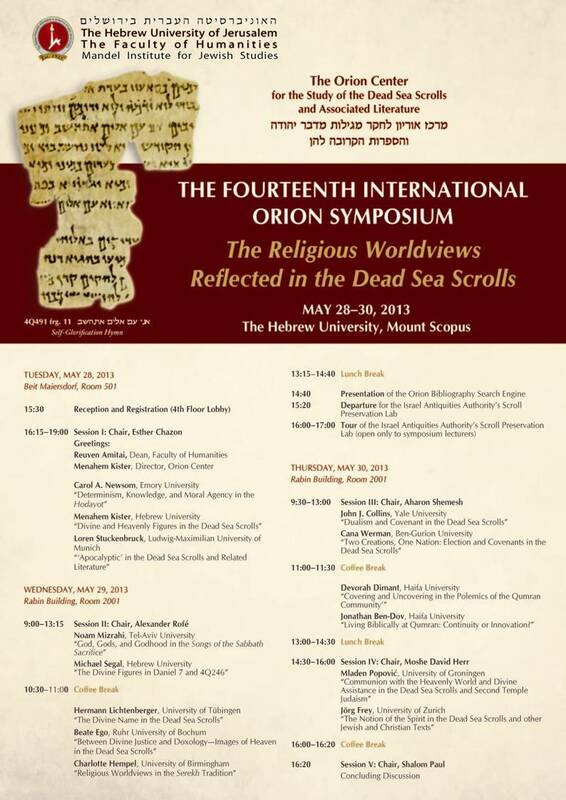 Our very own Ophir will be speaking on “The Ritualization of Narration in Jewish and Christian Liturgical Poetry” on the second day. And most importantly, stay tuned for information about a special Talmud blog event, also in Jerusalem, on June 27th. The Talmud Blog is a place – a virtual one, that is – where regular writers and guest authors gather to talk about everything and anything relating to classical rabbinic literature and its effect on Jewish culture. Ultimately, we hope that the blog serves as a kind of scholarly community – a virtual one, that is – for specialists and interested laypeople alike. But there is no doubt that virtual space can sometimes seem cold and impersonal. For that reason we’re happy to announce two upcoming ‘real’ events that we’ll be hosting later in October on both sides of the Atlantic. Both events will feature two young and cutting-edge scholars of the Babylonian Talmud, an opportunity to socialize with the people you may know only virtually, and a chance to hear about some of The Talmud Blog’s plans. We ask you, loyal reader, to join us for an event (if you live nearby) and to spread the word to potentially interested friends and colleagues. Join our growing list of co-sponsors for only a hundred dollars. Contributions of other sizes are, of course, also welcome. Those interested are invited to contact us at thetalmudblog [at] gmail [dot] com. On Tuesday, October 16, at 7:15pm, Zvi Septimus will be leading a discussion on “Was Resh Lakish the Gladiator an Ascetic or a Hedonist? How the Bavli Conveys Meaning” at Drisha, 37 West 65th Street, 5th Floor, New York. On Tuesday, October 23, at 8pm, Michal Bar-Asher Siegal will be leading a discussion in Hebrew on “The Babylonian Talmud and Christian literature: Resh Lakish and the Monastic Repentant Robber”. The event is being graciously hosted by the Pomrenze family at their home, 6 Crémieux Street, German Colony, Jerusalem. PLEASE JOIN US AND RSVP either by emailing us at thetalmudblog at gmail dot com, or by signing up on the Facebook event pages (New York event page; Jerusalem event page).